MILFORD, MI – General Motors safety experts here admit the auto maker’s new front-center airbag technology will give it a leg up on the competition, but say tighter federal crash-safety regulations only play a bit part in the rollout. GM will introduce the industry’s first front-center airbag, which inflates from the in-board side of the driver’s seat to protect first-row occupants in side-impact and rollover crashes, with its ’13-model large cross/utility vehicles. These include the Buick Enclave, Chevrolet Traverse and GMC Acadia, which will start arriving at dealers in fall 2012. “This is a new horizon for (safety) restraints,” says Scott Thomas, senior staff engineer-advanced airbag systems at GM. But it’s not driven by tougher National Highway Traffic Safety Admin. standards, he insists. “We’re doing this because it makes sense,” Thomas tells WardsAuto after a demonstration of the technology at GM’s proving grounds here. “We do not need this to pass any of NHTSA’s tests,” he says, while declining to provide a cost estimate for the technology. NHTSA revamped its crash assessment program for the ’11 model year, it says, because technology has advanced so much over the years that more and more vehicles sold in the U.S. have been earning the government’s highest 5-star rating. As a result, the safety agency has beefed-up scrutiny, which includes new items such as a difficult oblique pole, side-impact crash test, which provides consumers with a clearer picture of the industry’s safest vehicles. Auto makers say such changes have made it difficult to retain 5-star ratings for some vehicles. GM’s Lambda products were among those at risk in ’11. However, an enhanced seatbelt technology helped preserve the coveted stars. The Enclave, Traverse and Acadia already have earned “Top Safety Pick” status from the Insurance Institute for Highway Safety. Thomas declines to speculate on whether the government might make front-center airbags a future requirement, but says it puts GM at the forefront of emerging safety technology and ahead of its industry peers. Developed with supplier Takata, the airbag will appear as standard equipment on Enclave models. Since it is included only on those vehicles with power seats, some base-trim Traverse and Acadia CUVs will not feature the technology. But given so few customers buy stripped-down models of the popular CUVs, GM estimates 90% will have the extra airbag. According to WardsAuto data, base-models of the Traverse and Acadia accounted for 17.1% of combined sales in the ’11 model year. Look for more GM models to be equipped with a front-center airbag in the future. GM selected its Lambda platform for the initial rollout because CUVs target families and typically carry more than one passenger. Also, the vehicles are big, making it easier to integrate the system until GM can downsize it for smaller vehicles. “It’s somewhat difficult to package,” Thomas says. The front-center airbag weighs about 2.4 lbs. (1.1 kg) and takes about 26 milliseconds to inflate, or shortly longer than an outboard airbag. It is designed to cushion and restrain front-row occupants in side-impact accidents, where the head and torso of the driver and passenger often collide. 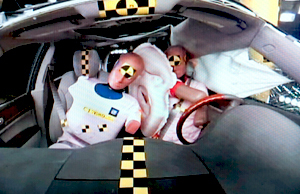 The airbag also helps reduce injuries and fatalities in rollover crashes and provides added protection for single drivers involved in collisions where the passenger’s side, or “far-side,” of the vehicle is hit. According to NHTSA data cited by GM, far-side impact crashes, which the front-center airbag primarily addresses, accounted for 11% of the belted-front-occupant fatalities in non-rollover impacts between 2004 and 2009. These far-side fatalities, where the occupant is on the non-struck side of the vehicle, also represent 29% of all the belted-front-occupant fatalities in side impacts, the data shows. GM and Takata spent three years developing the front-center airbag, although the genesis of the technology goes back to the auto maker’s Australian subsidiary. GM Holden essentially had been brainstorming safety innovations, and the idea made its way back to the parent company in the U.S.
GM also demonstrates at the event here a new forward-collision and lane-departure-warning system appearing as optional equipment on the ’12 Chevy Equinox and GMC Terrain midsize CUVs now arriving at dealers. The active safety technologies are available in combination as a $295 option. The systems use cameras instead of radar to keep costs down and can be disabled if a customer chooses. They also can be adjusted to fit owner preferences for when and how often the alarms sound. GM sees the technology as the first step on the path to connected vehicles, as well as a means to reducing rear-end crashes, which account for 28% of all police-reported accidents. The auto maker brings the system to market with supplier Magna. Although it does not enhance crash-safety scores, NHTSA will make note of it on its consumer website.